Give the gift of The Brown Hotel. If you are not sure of the perfect gift, The Brown Hotel offers gift cards of many denominations. 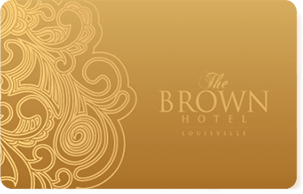 Available online or in person at the Front Desk, a gift card for The Brown Hotel may be redeemed for hotel stays, dining in our restaurants or in The Brown Hotel Gift Shop and The Gallery at The Brown Hotel. Purchasing a gift card from The Brown Hotel is easy. Simply select your preferred dollar amount from the drop down menu below. Enter the number of how many cards of that amount you would like to purchase and then click the Add to Cart button. When you have completed your selection click on the Continue to Checkout button and you will then be able to confirm and complete your transaction.